Rhinoplasty, also known as nose job surgery, offered by Board Certified Plastic Surgeon Dr. Louis Potyondy, enhances the proportions of the nose and makes the face more harmonic. Rhinoplasty can also correct impaired breathing caused by structural defects in the nose. Although the goal is to create facial balance and correct proportion, it is important to keep in mind that asymmetry exists in all faces, so complete symmetry of the face may not be achieved. If Rhinoplasty is being performed to improve an obstructed airway, a careful evaluation must be made as it relates to airflow and breathing. The Patient Receives Anesthesia: For the comfort of the patient, medications including intravenous sedation or general anesthesia are administered during the surgical procedure. The Surgeon Makes the Incision: Surgery of the nose can be preformed using a closed procedure or an open procedure. In a closed procedure, the incisions are hidden inside the nose, while in an open procedure, the incision is made across the strip of tissue that separates the nostrils (columella). Through these incisions, the skin that covers the nose is gently raised, allowing access to reshape the structure of the nose. The Surgeon Reshapes the Nose Structure: An overly large nose can be reduced by removing either bone or cartilage. Surgery of the nose may sometimes require additional cartilage grafts. Most commonly, cartilage from the septum is used. Occasionally, cartilage from the ear or a section of rib can be used. The Surgeon Corrects the Deviated Septum: (if necessary) If the septum is deviated, it can be straightened. Additionally, projections within the nose can be reduced to improve breathing. The Surgeon Closes the Incision: Once Dr. Potyondy sculpts the structure of the nose to the desired shape, the nasal skin and tissue is re-draped and the incisions are closed. Sometimes, additional incisions are placed in the natural creases of the nostrils to alter their size. For a few days, splints and gauze packing will likely support the nose as it begins to heal. While initial swelling usually subsides within a few weeks, it may take up to a year for your new nasal contour to fully refine. During this time, the appearance of the nose may gradually change as it refines to a more permanent outcome. 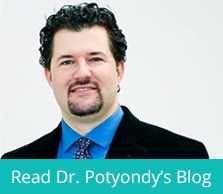 Results from nose surgery performed by Dr. Potyondy will be long-lasting. As the body ages, it is natural to have some gradual changes to the face, including the nose. However, most of the improvement from the surgery will be relatively permanent. Additionally, a healthy lifestyle and life-long sun protection will help extend the results.